Fast UID generation module for Python. mxUID™ provides a fast mechanism for generating universal identification strings (UIDs) with intention of making these UIDs unique with high probability in order to serve as object or data set identifiers. A typical use case is generating session IDs. Other areas where unique IDs play an important role are RPC-implementations, ORBs, user identification, message passing systems, object databases, etc. Fully interoperable with Python strings. Timestamps encoded in the UIDs. Automatic intialization of the UID generator. mxUID is written in a very portable way and works on pretty much all platforms where you can compile Python. We provide precompiled versions for all standard platforms, so all you need is a working Python installation. 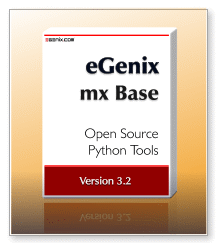 The package supports all Python versions since Python 2.1.
mxUID is provided as part of the eGenix.com mx Base Distribution. Please see the mx Base Distribution page for details regarding the license. The manual includes a reference of the available programming interfaces. The PDF file is also available as part of the installation and can be found in the mx/UID/Doc/ folder. mxUID is provided as part of the eGenix.com mx Base Distribution. Please see the mx Base Distribution page for downloads and installation instructions. mxUID was originally written for the eGenix.com Application Server. It has since been used in many web applications and application servers that we written for internal use, as well as for clients. Several other vendors are using mxUID for session management, e.g. Spirito uses it in their Dado application server and Point Nine Financial Technologies, London in their web-based trading system.